Diamond grit impregnated dressers have been developed from multi-point dressers. In contrast to the latter they are manufactured from diamond grit rather than a larger number of small natural diamonds. The advantages of the diamond impregnated dresser lie in its exceptional sharpness, which results from sharp edges and points of the diamond grit. Diamond grit impregnated dressers are ideally suited to the following applications, dressing resin, vitreous and rubber bond, fine grit and even "grit free" grinding wheels, as well as boron carbide grinding wheels, dressing single profile threaded and V-profile grinding wheels, for general dressing operations on centreless, cylindrical and surface grinding machines. Diamond grit impregnated dressers demand greater care in selecting the correct dressers for a given application. 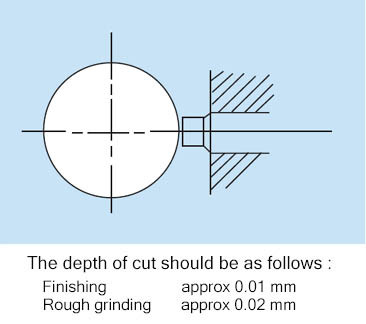 The bond and diamond grit size use ed are both variable according to the type of grinding wheels to be dressed. The size of the diamond grit particles should be matched to the grit size of the grinding wheel. Normal dressing speeds are used. A plentiful supply of coolant should be provided both before and during dressing to prolong dresser life. The diamond grit impregnated cutting face of the dresser should be set at an angle of 90° to the grinding wheel to be dressed, so that all the cutting edges of the diamonds grit are able to make contact with the wheel face. Note : While ordering please specify 'D' & 'L' dimensions & bond. Long Life : Load is divided on many diamond particles in tough durable matrix. No Resetting : In DGI Diamond Particles are totally consumed. The result is reduction in inventory. Economy :Dressing accomplished with maximum efficiency resulting in more pieces per dress. 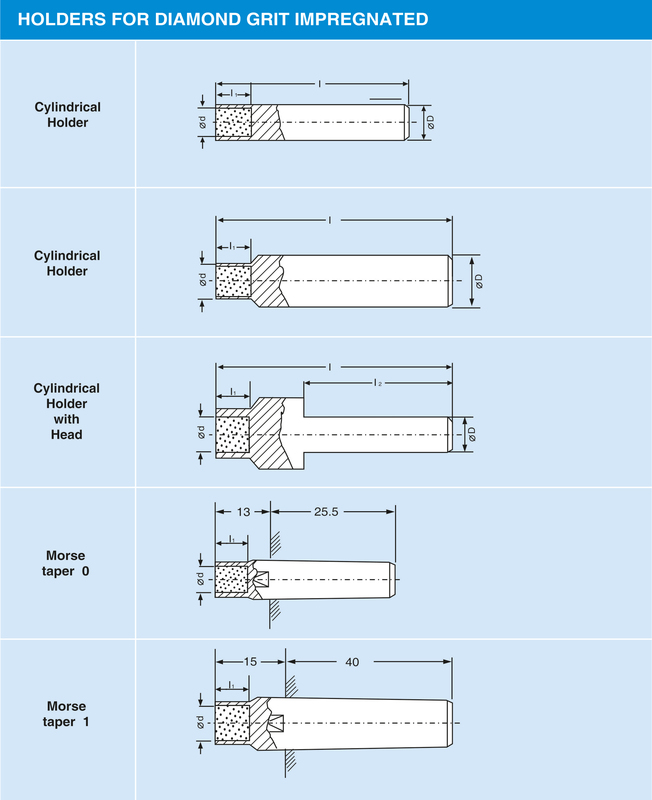 Versatile :DGI are used for the dressing of the out side diameter and side face of fine to coarse grinding wheels. 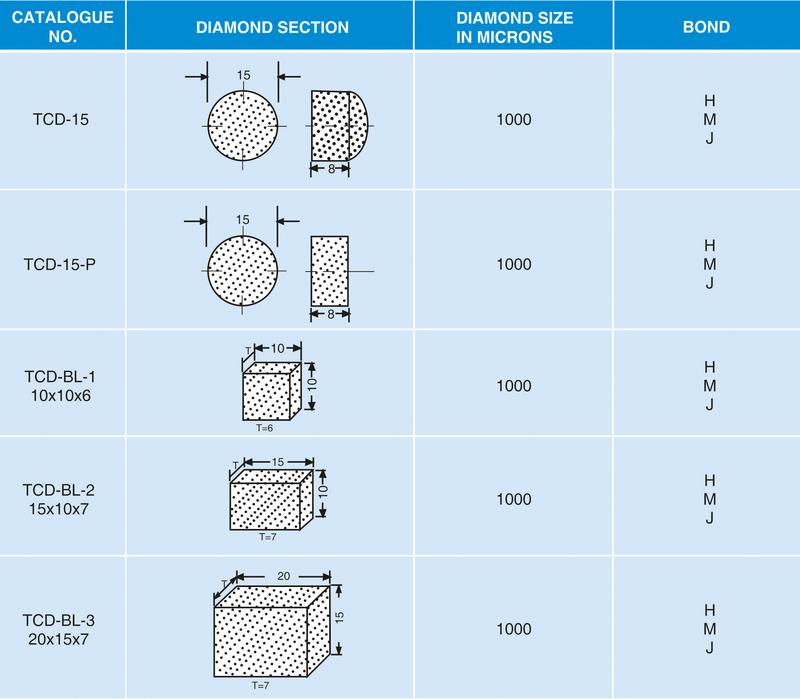 DGI Diamond Dressers all also available in different Diamond Grit size. 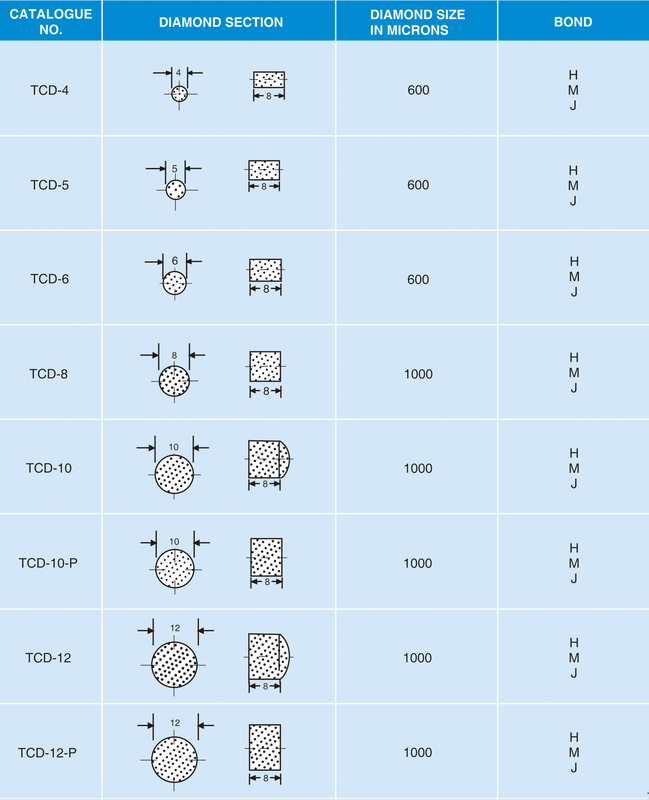 J = Tungsten Base Bond, M&K5 = Special Tungsten Carbide Base Bond, H = Special Tungsten Moly Base Bond.